Each retention policy defined by your company or organization is associated with a retention schedule. This is used to apply all the characteristics of the retention policy. Upload your retention schedules to the AODocs Retention Module with a CSV file. Policy Code String Forms part of the retention ID (see note below). Must have a value. Provides the value of the Retention ID property in your AODocs document. Retention Time Integer Number of years before documents are deleted once they enter the retention period. Must have a value and it must be a positive value. Provides the value of the Retention Time property. Record Category String A meaningful label depending on your business case, for example, "Taxes". Provides the value of the Record Category property. Disposal Pending Duration Integer Not used - leave empty. Country String Forms part of the retention ID (see note below). Provides the value of the Retention ID property. Function String A meaningful label depending on your business case, for example, "Administration". Can be empty. Has no corresponding property. Subfunction String A meaningful label depending on your business case, for example, "General Administration". Defines how the Event Date property is filled in. Learn more about Basic Offset. Provides the value of the Event property. Description String A meaningful description depending on your business case. - The Policy Code and the Country form a unique identification code called the retention ID. In the example below, the retention ID is ADM156-US. You can't upload two retention schedules with the same retention ID. - If required, you can use different names for the columns in your CSV file, but you must include all columns in the order indicated. 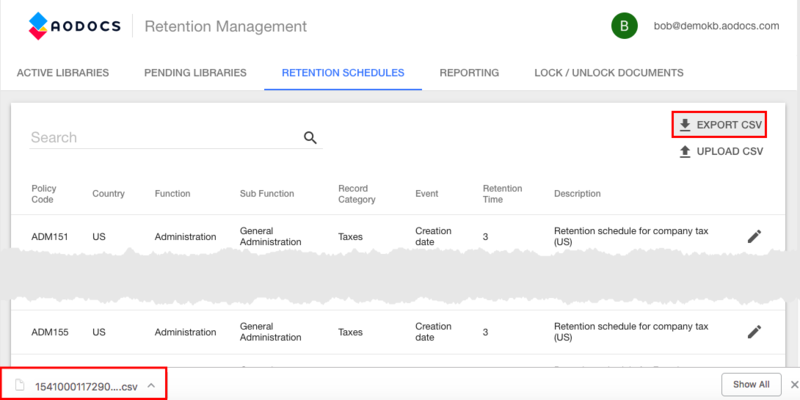 You can access a template of the retention schedule as a Google Spreadsheet. In the AODocs Retention Module, all the existing retention schedules on your domain are listed in the Retention schedules tab. When you have added a retention schedule to the AODocs Retention Module, you can assign it to libraries on your domain. 1. In the Retention schedules tab, press Upload CSV. 2. In the pop-up, select your CSV file containing one or more retention schedules and then press Open. A pop-up opens to confirm that the retention schedule was added to the AODocs Retention Module. The retention schedules you imported are now displayed in the Retention schedules tab. If the CSV file does not comply to the required schema, the retention schedules aren't uploaded and the information pop-up displays the invalid lines. In the example below, a column is missing from the CSV file, so no retention schedules could be uploaded. If the CSV file complies to the required schema but one of your retention schedules is missing a required field, such as the Country, the correctly formatted retention schedules are uploaded and the information pop-up displays the invalid lines. Note: You can update retention schedules or deactivate them, but you can't delete them. Learn more: Manage your retention schedules. To export a list of your retention schedules, press Export CSV. A CSV file is downloaded. It lists all your retention schedules, including those that have been deactivated or that aren't yet assigned to libraries.